This movie’s story is based on some real American naval incidents that took place in 1823 and ’24, albeit distorted almost beyond recognition. Yes, young Lt. David Farragut—later to be the Admiral Farragut of Civil War fame—did sail with Commander David Porter in search of the Caribbean lairs of some pesky pirates, but they did not disguise an American ship-of-the-line and its crew as pirates to do it. And yes, Porter did illegally put ashore a crew on Spanish-held Puerto Rico to raid a port with the absurd name of Foxardo, but he didn’t do it to rescue Farragut and a Portuguese countess from a lurid Spanish torture chamber. Everything else here is naught but a tissue of lies and deceit. 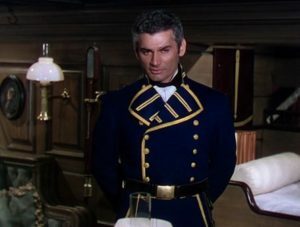 What we have here is a turgid naval bromance between Commander Porter (Jeff Chandler) and Lt. Farragut (Scott Brady), in which Farragut keeps getting into trouble and Porter keeps getting him out, huffing and pretending indignation, but really we know from the start that they’re meant for each other. Chandler channels the bluff Gregory Peck as Hornblower and does all right, considering what he has to work with, which isn’t much; however, Brady, though good-looking, is talent-free and quickly becomes tiresome. Not even the officers’ tepid romantic rivalry for the charms of the vapid Countess Margarita (Suzan Ball) can bring Brady to life. In truth, not much happens worth getting excited about, as the disguised ship sails around failing to find any pirates until it has to put ashore for some plot, I mean provisions. They do this twice! Occasionally characters faux-dramatically reveal their all-too-obvious secrets, or give each other McGuffins for some reason or other, but it’s hard to care. At last the Americans sailing around in their ridiculous pirate outfits—costumes left over, like the sets, from Against All Flags, and they look it—accidentally figure out that all the real pirates are gathered in a secret location preparing to ambush a treasure fleet (or something). But they don’t do anything about it, really, except let Farragut get captured again, and we only ever see one actual pirate, a buffoon with the cartoonish name of Captain Scarjack. What is this, a Scooby Doo episode? The fine character actor Joseph Calleia belatedly appears as the wicked Spanish aristocrat behind all the shenanigans, and gets off a few good lines, but even he can’t save this turkey. Abandon ship!